If you’ve ever accidentally knocked a shampoo bottle off a shower caddy, or banged your elbow into a shower wall, you’re probably familiar with the challenges of showering in a confined space. If only your shower stall was – well, not a stall. At Dreamstyle Remodeling, we can make your wish for a more functional showering space a refreshing reality. 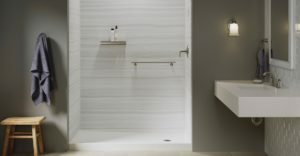 As America’s #1 Remodeler, we have partnered with the respected manufacturer Kohler to bring you the Choreograph™ shower wall and accessory collection. The Choreograph collection is an all-inclusive shower system that will make your daily shower a more enjoyable experience. An innovative system, the Choreograph allows you to customize your showering space to suit your needs and aesthetic preferences. For instance, if you have a standard alcove shower, you can choose a Choreograph wall kit that includes three walls of the same design and color. Or, to achieve a customized shower space, you can combine full wall panels with accent panels in different configurations for greater design flexibility. Plus, Choreograph walls come in a variety of appealing colors, patterns, and textures that can blend beautifully with your existing bathroom décor. If you’re ready to start enjoying these and other features that the Choreograph shower wall and accessories collection provides, contact Dreamstyle Remodeling and schedule a design consultation. When you do, be sure to ask about the diverse financing options that we offer to make your shower remodel project more affordable.